I had this video link in my bookmark archives….a very simple and straight forward speech by a school girl from Canada….echoes every environmental concern – relevant more than ever today. This undated video should, among many others, actually help us wake up…its high time…its not about money, career or expensive living. It is all about sensible minimal living which will allow existence of life on the planet. Thinking about every thing we do and not hiding behind the very oft used phrases/words – “cant help it” or “convenience” is the need of the hour. If one really wanted to make a sensible choice, they could do it. Ignorance, or lack of common sense is what makes involuntarily-earth-hating crowd, the people they are. Being eco friendly is lot more than not using plastic bags. I am tired of being called as someone who advocates against plastic bags.Yes, that I am, but there is more to living a green life than just that. The whole terminology kicks my soul. It is sad that we humans first take the fast lane, do some considerable damage and then trace back our steps to go back to where we were. Given this fact, all the jargonology- Green, eco-friendly all make no sense. It seems like a mockery on groups which work in favor of the planet, in favor of LIFE. Jargons don’t matter. Actions make a difference. People need to understand that the choices associated with food, clothes and shelter (our house, furniture, furnishings etc) are all what influence our earth friendly living, or the lack of it. Fancy terms like recycling, composting don’t matter if you buy your grocery and supplies in a plastic bag and use it for throwing your trash. Think about the landfill you will contribute to or the nearest water source you will pollute by using and dumping the plastic bag. Chiffon, nylon, acrylic and polyester clothes you buy, will never bio-degrade. (Let us keep in mind that we have not considered the entire value chain footprint yet.) 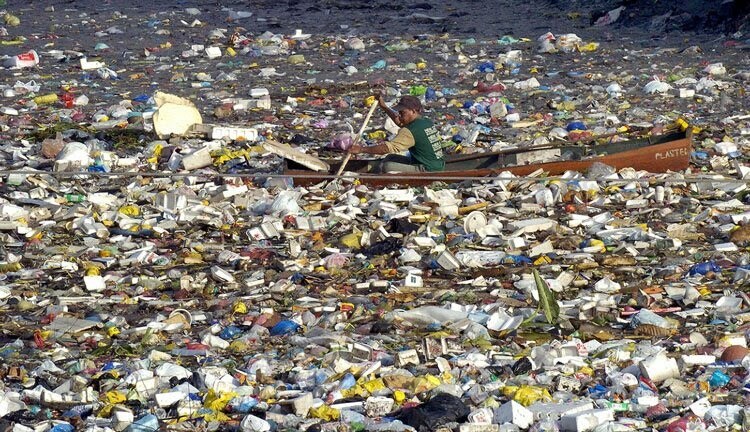 Give a thought to before you purchase – synthetic furnishings (curtains, upholstery etc), your kitchen chopping board or the throw away plastic spoons and forks, paper plates, tissue paper/towel, hawaii slippers/flip flops, beverage bottle, yogurt container buy etc… Everything we choose to use, has an impact and it does matter. 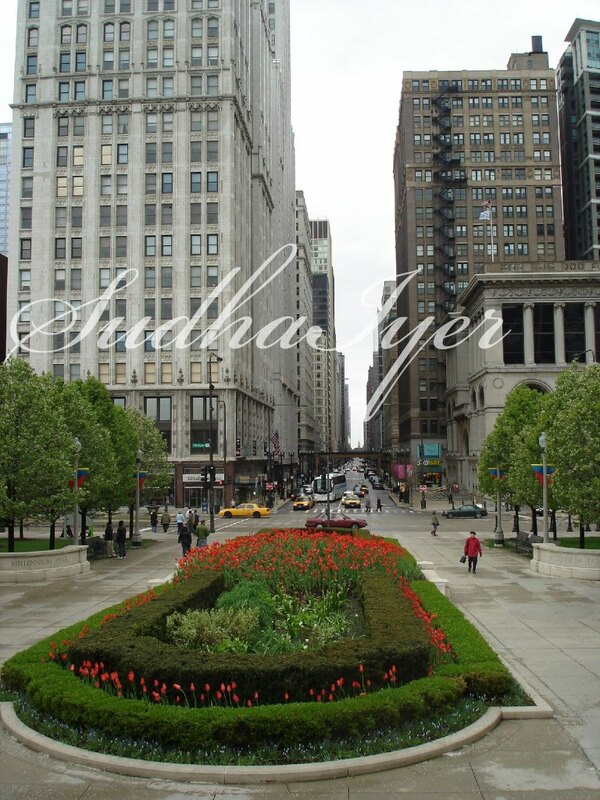 All this is to make your surroundings look like this. 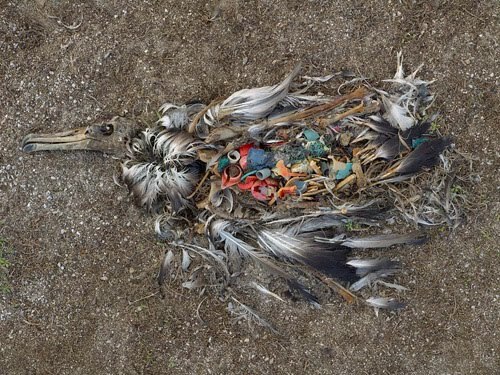 Birds and marine life mistake our plastic garbage and debris for food and ingest them only to die. We are responsible for this. This is neither a regular cyclic change our earth goes through nor is it a natural occurrence. We should be ashamed to see such impact of our mindless actions. We have no right to disturb the eco-system. If you think it doesn’t affect your life or health. 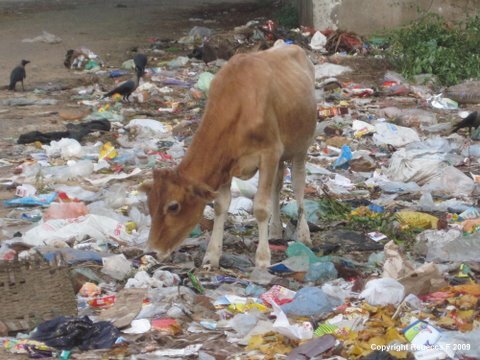 Think again, look at this cow munching a plastic bag (in india). Is it too late for a wake up call? Just like that of other green-crusaders, my quest for minimal footprint lifestyle is a stressful journey too. What I dint know yesterday, I learn today. And what I learn and imbibe, I implement in my life right away. We need the will to open up to ideas and think beyond our comfort zone. This a never ending process and needs time and effort. It is worth the effort and is all for our own good! I am so tired of people arguing with me or anyone else who speaks about going gentle on the planet. It is just their way to cover up their useless ego and be the escapists they are. It makes the job for a green crusader much more difficult because we not only need to clean up the mess these escapists leave behind but also take things forward with such skeptics in tow. It is tiring but we don’t have time to complain, how wonderful would it be if our fellow earthlings, who refuse to do their bit, at least start thinking (for now). Time and again, I have maintained that, we as a civilized society have gotten used to a certain lifestyle and feel that shifting from usual is difficult. Come to think of it, let us consider a simple things like grocery plastic bags. There was a generation which survived without ready to eat food packs, plastic beverage bottles, and disposable cutlery. It is therefore not unimaginable to survive with out them. Let us make an effort, start with small changes and leave this planet habitable for our children. They deserve that much and more. Thanks 4 sharing this wonderful speech !!! Thanks for sharing this great stuff. Plastic usage is really unsafe and I ever prefer to use the sustainable, sophisticated, biodegradable and eco-friendly packaging products. Very relevant. The battle can be won only when the issue of conservation is inculcated into young minds. That was awesome! Probably one of the more interesting reads in awhile.This looks freaking awesome! Wonderful…had watched that video sometime back & had Favorited then! ” If one really wanted to make a sensible choice, they could do it. Ignorance, or lack of common sense is what makes involuntarily-earth-hating crowd, the people they are” …well said.